Eggplant is my favorite veggie and I can eat it in any form. 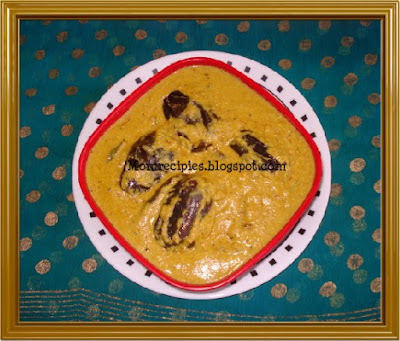 Bagara Baingan is a Popular Hydrabadi special dish.I have never been to a Wedding receptions or functions in hyderabad that doesn't serve Biryani and Bagara Baingan. 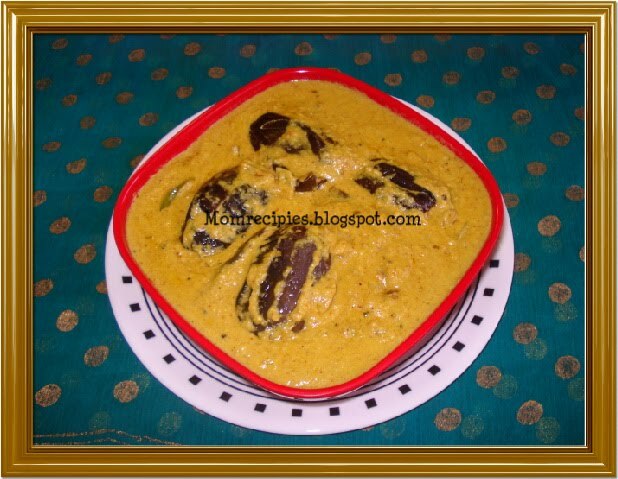 Its rich gravy is made with peanuts and sesame seeds which gives unique flavor to the Eggplants!! !This is my family's favorite dish. 1) First take a pan and dry roast Groundnuts.Then Dry roast Sesame seeds. 2) Grind together roasted groundnuts,sesame seeds, grated coconut in a blender / Mixer to a fine paste with little water.Keep aside. 3) Wash eggplant and cut them into 4 vertical parts without cutting the base.Deep fry them till they are 70 % done and if you touch it should be smooth and keep them side. 4) Heat oil in pan.Add cloves, bay leaf, cinamon stick, cardamom,mace . Then Add mustard seeds and when they start spluttering, add cumin seeds , Fenugreek seeds and curry leaves. Fry for a minute. Then add green chillies paste, chopped onion and hing. Fry onions till it gets transparent. 5) Add turmeric powder, ginger - garlic paste, red chilli powder, coriander powder, cumin powder, . Fry for a minute.Add little water and bring it to boil. 6) Then add paste of peanuts, sesame seeds , coconut paste& water. Add salt to taste.Cover with lid and Cook for 10 minutes on medium flame.Keep Stirring frequently. 7) Then add tamarind juice ,Jaggery and cook .When the oil oozess out add eggplants to the gravy and cook for 10 more minutes till eggplants are 100 % cooked. 8) Garnish with chopped coriander. Serve hot with Roti ,Chapati ,Puri , Biryani ,Rice. 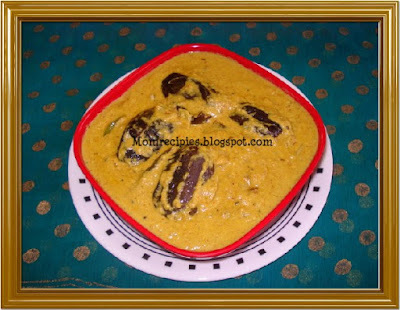 Bagara baigan looks creamy and rich! i like this too but rarely make it because of the deep frying bit :-)your dish is tempting me now!